300 pounds weight capacity hydraulic scissor lift designed for MX dirt bikes lifts your motorcycle to comfortable work height. 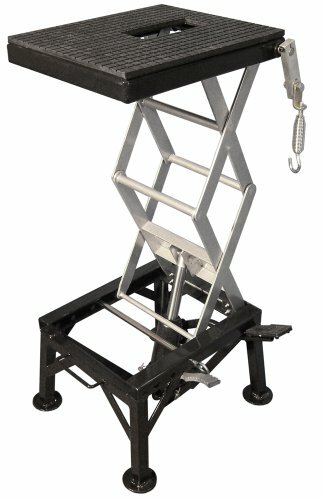 Adjustable height, from 14 inch thru 33 inch inches off the ground with foot pedals incorporated to lift and lower stand. Foot peg secure springs system to stabilize the bike and a safety pin for extra insurance. Heavy-duty steel frame construction with a black hard coat finish. Oil and gas resistant rubber top with a large oil drain hole for easy oil changes.